Three ships that were regular visitors to Workington with iron ore in the 1950s were the Aqguila, Lugano and the Locarno. 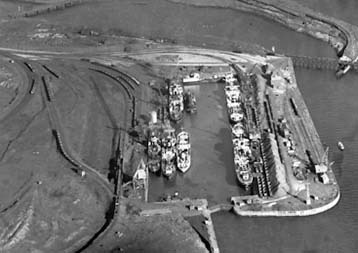 Above is a photo of the Locarno arriving at Workington in the 1950s, also a aerial photo of the Prince of Wales Dock, Workington on the 3/08/1957 with the top left showing the Locarno. The 3 ships on the left hand side nearest to the quay are the Lugano, next to her is the Aquila and on the end is a ship called the Rudolf. There may have been other ships of the Tuillier shipping, coming in with iron ore, but the 3 are only ones I know about. Readers may be interested to know that the photograph of Quickthorn on page 56 of the July edition was taken by me at Galway Dock on the 16th February 1978. She is lying alongside the premises of McDonogh’s coal and fertiliser importers inter alia. The Irish courtesy flag may be seen on the starboard yard above the funnel. 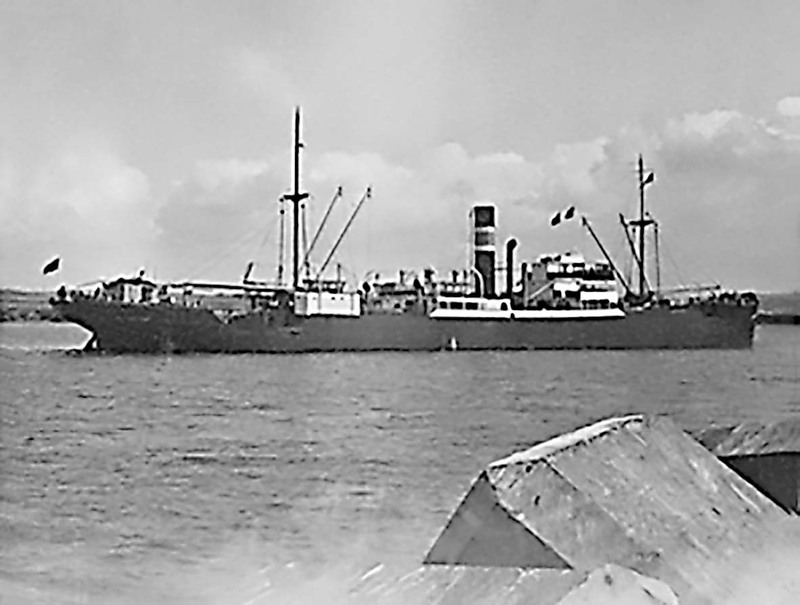 The redbrick building ahead of her was the Galway office of the Limerick SS Co. Ltd. and the regular berth of their Oranmore (later Redthorn). Today the most regular trader to Galway is the tanker Galway Fisher of Fisher on an almost constant shuttle from the Irving Oil Refinery at Whitegate, Cork Harbour so there is still a connection to the companies mentioned in the Coe article. Mike Bryant (The Troopship Dilwara) was not quite correct in saying that B. I. had the most modern troopship. This was Bibby’s Oxfordshire of 1957, basically a sistership to the Nevasa of 1956 but of more modern appearance. Bibby also had the near identical to Dilwara (1936), the Devonshire of 1939. They had troop deck accommodation for approx. 800 male other ranks forward of the bridge and cabin accommodation of 3 categories midships/aft for 325 officers, families and servicewomen, mainly Army but not exclusively and the small permanent service staff including the nurses. The latter pair proceeded at all of 13 knots due, presumably for reasons of economy as normal for low value cargoes in bulk and the originally perceived need to acclimatise troops being posted to the tropics. The former pair with accommodation for 1,000 troops and 500 cabin passengers did rather better at 17 knots, although they were capable of more, and did the longer runs ‘East of Suez’. Also at this time were the smaller troopers, the Empires Parkeston and Wansbeck serving the armed forces in Germany but they were not built as such. As for the Falklands conflict, mention should have been made of North Sea Ferries ‘Nordland’ which was in the thick of it from the beginning and did not return until February 1983 long after the QE2 and Canberra who returned in June and July 1982 respectively. Perhaps the omission was due to it being thought of as just a ferry, but she was of approximately the same gross tonnage as Mike Bryant’s Dilwara nevertheless. Also taken up for trooping were the former NZ inter island ferry Rangitata, which in the event didn’t do any trooping but served as an accommodation ship and the former Sealink ferry St. Edmund, both of which however missed out on the active phases, and of course none of the three were troopships proper. While the change to air trooping was, in retrospect inevitable it was perhaps precipitated by the ending of National Service and the rapid rundown of overseas commitments and garrisons, such that the movement of large bodies of troops was no longer required together with the existence of an already being paid for RAF Transport Command fleet in existence with enough capacity. Following an Offshore survey on a Chinese owned Heavy Lift vessel in United Arab Emirates I had the unique opportunity of photographing the ill-fated Queen Elizabeth II on my return shoreside on Thursday 25th last week. For the last two years QE2 has been berthed at the same location, starboard side to the quay-wall just outside Port Rashid and seemingly the interior fittings are beyond reclaim! What a dreadful conclusion to glittering career and a classic profile. I receive your journal because I advertise my battlefield tours in it. But it distresses me that all the photos of ships built over the last 40 years are depressing. The ships are architecturally hideous. None of your correspondents seem to note or care that naval architecture is appalling nowadays. I sailed the Atlantic on the Queens in the 1950s, on the SS United States, whose lines were exquisite, and Canadian Pacific liners like the Empress of France, a beautiful ship. 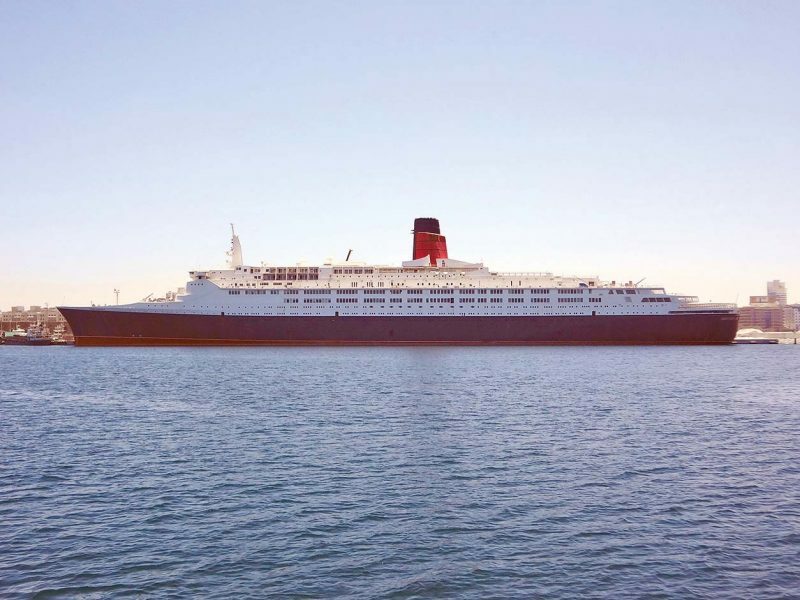 Even later liners like the France and the QE2 were elegant, despite the aesthetic limitations imposed by putting their single funnel near the stern. Modern cruise liners, seen at their worst in the Guidecca Canal in Venice, dominating Serenissima’s skyline, are floating airport hotels that offend every sense. Their balconies make streamlining, elegance impossible. The joke is that no-one sits on them because they are pokey and windy. Trinder, Anderson & Co. Ltd.